Camping season is upon us!! Hallelujah!! With that being said, here are a few gentle reminders of some basic camping etiquette as we embark on another great camping year! Noise – Most campgrounds have quiet hours; and its for a good reason. Being a good camping neighbor includes being mindful that the young mom and dad next to you are trying to keep their little ones asleep after a busy day of camping and do not want to hear your campfire shenanigans late at night. Be Neighborly – Even though its only temporary, each camper’s little slice of home – their campsite – is just that: theirs. We are all entitled to a little courtesy and privacy at the site. Walk around, not through. Pet Friendliness – Many campgrounds are pet friendly and why not? Being able to travel with your furry friend is one of the things that makes camping so popular. That being said, its important to remember that the rest of the campers around you do not necessarily want to hear Fido all day and all night. If you have a particularly “talkative” or anxious pet, remember to turn on your TV or radio to distract them if you are going to be away from your site for any length of time. And do we even have to mention how important it is to pick up after them? Nothing worse than pulling into a campsite and finding that the camper before you left behind some “land mines!” Better still, walking your pet and not picking up is just plain rude! Reuse and recycle those plastic grocery bags!! It doesn’t take a moment to pick up your pet’s waste so your neighbor doesn’t risk walking through it! Keeping your pets on leash at all times is another important reminder. Holly Shores Dog Park offers a fenced in green space for your fur babies to run off leash! Lend A Hand – One of the best things about camping is the “community” it provides, from park to park, site to site. Camping is an easy way to meet and become friendly with folks from all over! Being part of a community means lending a hand and one good turn deserves another! How often do you see the camper next to you pulling in, red-faced and frustrated after trying to park the camper, open the slides, hook everything up and all this after sitting in holiday traffic with screaming kids and a ‘nagging’ spouse?? How good does it feel to walk on over and ask if they need a hand, or even just say hello and introduce yourself? You never know – you may need that smile and handshake someday! 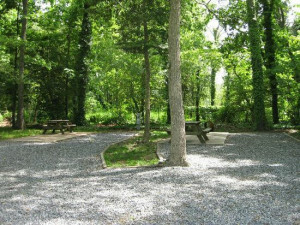 Leave It Like You Found It – Although part of running a top-notch campground includes daily care of the campsites, it is always nice to see campers leaving the site the way they found it. Tidying up your site and making it ready for the next camper is just plain courteous and it helps the campground too! A side note to this is to be considerate of check-in and check-out times: campgrounds schedule these times for a reason. 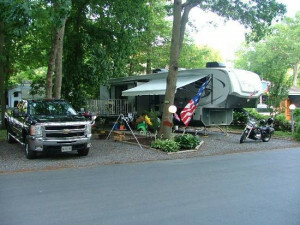 There are tasks to be completed so that every customer can enjoy the best the campground has to offer. Most often, the time between check-out and check-in is when the staff must do site clean-up, trash removal, and other site maintenance without the added congestion of trailers coming and going. It is very helpful for customers to abide by the check-in and out times.